There may be occasions where a staff person forgets their password and is unable to log into their Staff Portal. Your staff is able to use the Forgot your password? link to generate a new password. The password can also be reset through your database. 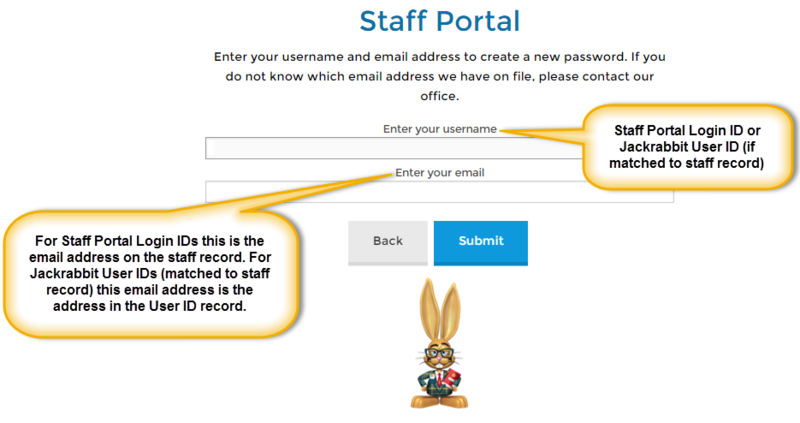 How to reset the password depends on whether the staff person is logging into the Staff Portal with an assigned Staff Portal Login ID or whether they are logging in using their Jackrabbit User ID and password (when staff person is linked to a User ID). The Forgot your password? 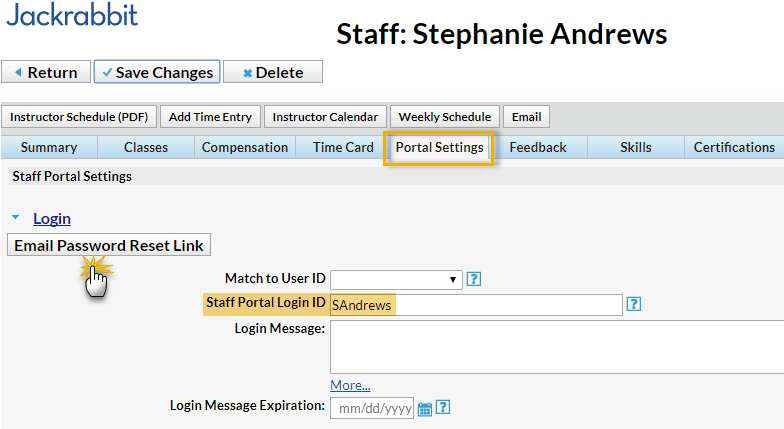 link on the Staff Portal login page allows your staff to quickly generate an email with a link to reset their password. This email will be sent to the email address you have on file for them in their Staff record, on the Summary tab. The password reset link is time sensitive and will expire in 24 hours. When a staff person, who has an assigned Staff Portal Login ID, is resetting their password they will need to enter the email address located on their Staff record. 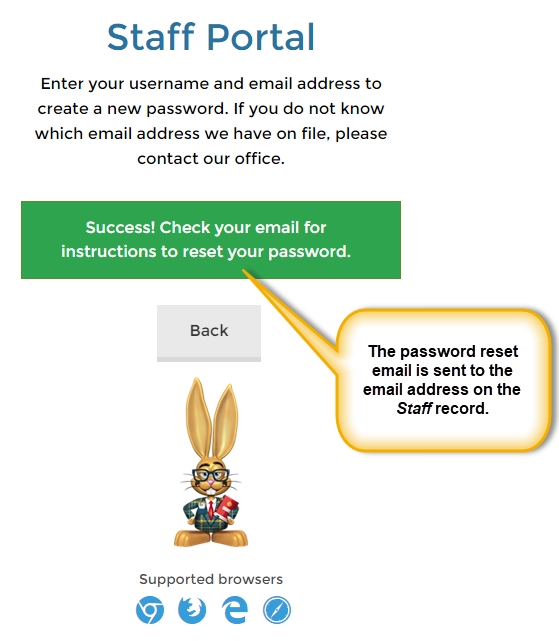 Staff persons who log into the Staff Portal using their Jackrabbit User ID (which has been linked/matched to their Staff record ) must reset their password using the email address located on their User ID profile. In both cases the password reset email is sent to the address on the Staff record. 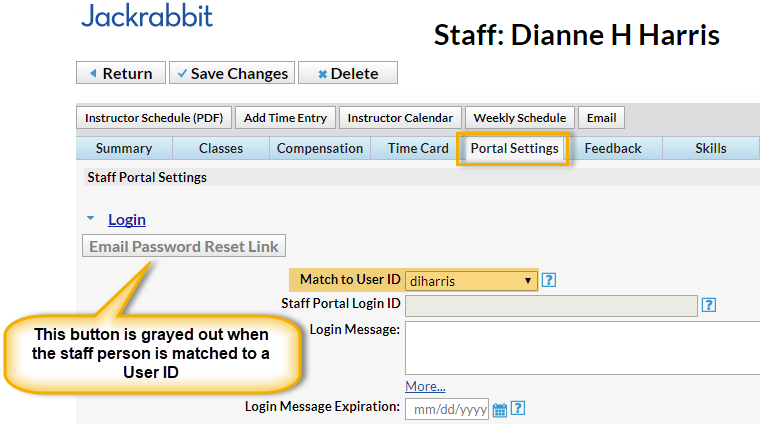 A staff person's Staff Portal Login ID password can be reset in the database by any User with the Time Card and Portal Settings tab permission (in the Staff category of permissions). Locate the staff person's Staff record from the Staff menu > List Active Staff. Go to the Portal Settings tab. Click Email Password Reset Link. Note: If this staff person is matched to a User ID this button will be inactive (grayed out). The password reset email will be sent to the email address on their Staff record > Summary tab. The reset link in a password reset email is time sensitive and expires in 24 hours. 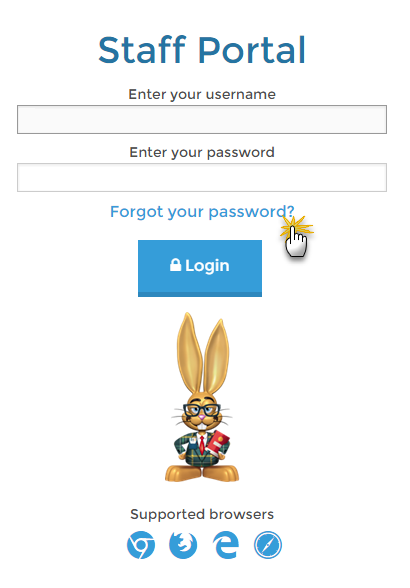 When a staff person who logs into the Staff Portal using their Jackrabbit database User ID has forgotten their password, a User with administrative permissions can reset the password from within the database. It must be done from the User ID record, however, not from the Staff record. The Email Password Reset Link on the Portal Settings tab of the Staff record will be grayed out when the staff person is matched to a User ID and it cannot be used to reset their password. Go to Tools > Edit Settings > User IDs. Click the link on the User ID to edit. Enter the new password and confirm. No email is generated for this password reset. The staff person must be notified and given their updated password.